Sutton recorded two tackles (one solo) during Sunday's 16-13 win over Cincinnati. 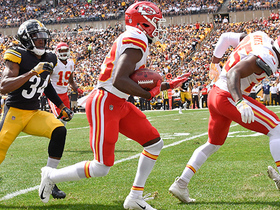 Analysis: After a hamstring injury limited him to just five games in his rookie season, Sutton rebounded nicely to finish the 2018 season with 22 tackles, an interception and two forced fumbles in 15 games. Still, he only played on 23.1 percent of Pittsburgh's defensive snaps, contributing more as a special teamer. He has two years remaining on his current contract and should return to provide cornerback depth. Sutton has seen reps with the first-team defense as a slot corner at practice this week, Ray Fittipaldo of the Pittsburgh Post-Gazette reports. Analysis: Sutton has played only three defensive snaps since Week 8, but he's worked with the starting defense while top nickel corner Mike Hilton has worked with the scout team. Coach Mike Tomlin indicated he's willing to shake things up with the Steelers losing three straight games, which could prove to be a window of opportunity for Sutton. Sutton (personal) was a full participant at practice Wednesday. Analysis: Sutton was unable to play in Sunday's loss to the Chargers due to personal reasons but has fully rejoined the team for Week 14. The 23-year-old should resume his role as a depth cornerback and special teams contributor for the Steelers. Sutton (personal) is inactive for Sunday's game against the Chargers. Analysis: Sutton missed practice Friday due to personal reason and won't be able to play Sunday against Los Angeles. The 23-year-old has played only three defensive snaps over the last four games, so the Steelers defense shouldn't be significantly impacted. Sutton (personal) is officially listed as questionable for Sunday's game against the Chargers, Teresa Varley of the Steelers' official site reports. Analysis: Sutton missed practice on Friday due to undisclosed personal reasons, and his availability for Sunday's tilt against the Chargers is evidently in question. The depth cornerback has not seen more than three defensive snaps since Week 8, so even if he were unable to suit up, Pittsburgh's defense would likely emerge unscathed. 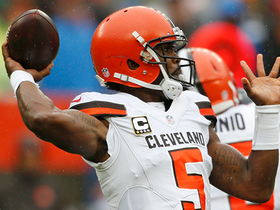 Sutton totaled two tackles (both solo) and an interception in Sunday's 21-21 tie against the Browns. Analysis: The rookie looked lost at times, but showed why Pittsburgh selected him in the third round when he intercepted Tyrod Taylor with 16 seconds left in regulation to force overtime. We'll know more about the status of Joe Haden (hamstring) over the next few days, but it could result in additional playing time for Sutton against Kansas City in Week 2. 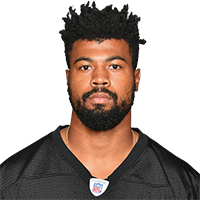 The Steelers activated Sutton (hamstring) from injured reserve Tuesday, Teresa Varley of the Steelers' official site reports. Cleveland Browns quarterback Tyrod Taylor and wide receiver Rashad Higgins connect for a 38-yard gain against the Pittsburgh Steelers.